You may remember about a month ago, I posted a really excited “Box Day” post and our first impressions of Oak Meadow’s Third Grade program. Today, I am even more excited to share with you our review of this program. I am happy to tell you, it lived up to my hopes and expectations. What is Oak Meadow’s Third Grade Program? The Heart of Learning explains Oak Meadow’s philosophy for working with young children, and offers deep advice on the development of children and how to best work with them. It took reading over this book a couple of times for me to really grasp the ideas in it; every time I bring it out, I come across another gem. Many of the issues faced by new Homeschoolers- from sibling fighting, grumpy children, or setting a routine are covered in this book. For example, when talking about children having conflicts with each other, the Heart of Learning gives ideas for re-direction. I’ve been using the ideas in this book with ALL my children, and have found it is really helping, especially with my new-five year old. The Home Teacher’s Process Manual contains guidelines and instructions for the various skills children in grades Kindergarten to Third will be working on (recorder playing, drawing, watercolor, working with clay, storytelling, and singing) as well as a lot of practical information on how to make “process time” successful. This book has step by step instructions and diagrams, and is a necessary part of each of Oak Meadow’s K-3 programs. The Syllabus is the core of the program. The year is broken down into Trimesters, and each Trimester section of the syllabus contains an Introduction. This introductory section is about 20-30 pages long, and contains a complete overview of what the child will be learning for the next trimester, as well as detailed instruction on how to teach each concept. For example, the Math section of the introduction explains how to teach borrowing and carrying with a story about “Mr. Place Value.” It also includes instructions on teaching multiplication in a way I have never seen outside of Oak Meadow. Children are encouraged to see the patterns created with skip counting by creating designs, and times tables are taught with rhymes and rhythmic body moments (you know the rhyme “one, two, buckle my shoe?” like that, only one for each of the times tables, many with movements associated with the rhyme). These physical movements along with the rhymes help the child memorize the times tables in no time flat, and would be extremely beneficial to children who are kinesthetic learners. These instructions, and rhythms are not repeated again in the curriculum, so you will find yourself referring back to the introduction for each trimester again and again as you teach. Neat, right? There is also a rhyme for 3. After learning the rhyme and drawing the pattern in his main lesson book, he has skip counting by 3’s down to a science. I really enjoyed these overviews because they gave me a quick overview of what exactly needed to be taught in the next trimester without needing to read over each individual week’s assignments. After the trimester introduction, the Syllabus is divided by weekly “Lessons.” Each day is started with circle time, which includes a morning verse, a movement activity/verse, and a closing verse. 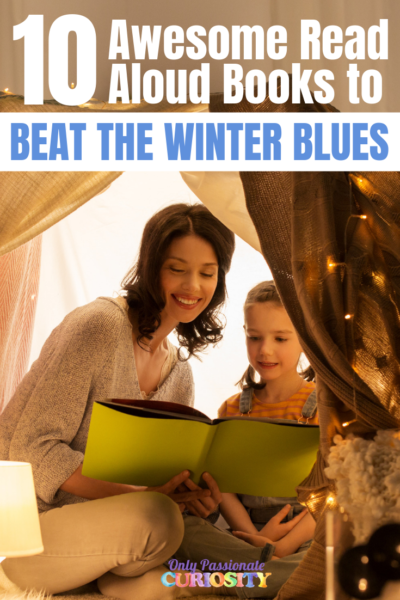 Included in the appendix is a list of Poems to enjoy and memorize during circle time, as well as active verses to get your child’s blood pumping and mind moving as they start the day. The appendix has enough choices to fill the year, and many of the verses are themed by season and contain important information so they are educational and fun. After Circle Time each day, you’ll need to decide which topics you are going to teach. The weekly lesson is not broken down by what to do each day, and instead allows you the flexibility to teach on your own schedule. They recommend setting a routine for yourself, and recommend a schedule for the day in the introduction of the syllabus. I found that I could easily cover everything in a week’s lesson working about 3-4 hours a day. Lessons are done in what Oak Meadow calls the “Main Lesson Book”. You can purchase these books with the Craft Kit, or separately, and they are large, blank spiral bound books for your child to put all their work in. Illustrations, writing assignments, art, summaries, math- everything is done in these books. Each family does their Main Lesson Books a little differently. Some put all subjects in the same book, or use a separate book for each topic. In our home, we used one book for language arts, history and science, and did Math on separate papers. Language Arts: Language Arts is taught mainly through the use of the Oak Meadow Folk Tales book. Each week, you will read or tell (the program prefers you read and re-tell the story rather than read it verbatim) a folk tale from the book, and your child will need to tell you the main idea of the story, as well as write a summary sentence in their main lesson book. Other instruction in grammar, spelling, phonics and other elements is given throughout the year, but the process of using the Folk Tales as a base is a constant for the Third Grade Program. Included with the Third Grade Curriculum Package are 7 classical books, Pippi Longstocking, Peter Pan, The Wizard of Oz, The Velveteen Rabbit, Winnie the Pooh, and Charlotte’s Web. Your child will read these independently during the year, and are not assigned work along with them. Cursive handwriting is taught starting right away in the Third Grade Syllabus (either by mimicking models written by you, the parent, or using the optional D’Nealian cursive handwriting book combined with cursive copy work). Mathematics: Oak Meadow does not use a separate math program or math worksheets, and instead relies on you as a parent to write the math problems for your student to solve. Detailed instructions for teaching each math concept are given in the introduction to the trimesters, and each Lesson includes general guidelines such as “review 6’s times tables” or “do 20 problems with borrowing in your main lesson book”. You would write these problems, or dictate them to your child and then check their work to ensure they were mastering the concept. Social Science: Social Science is also taught through the use of stories. Each week, you will tell or read an included story which will be the basis of the lesson for the week. The social science section includes suggestions for discussion about the story, copywork relating to the story, and both active and main lesson book-based activities (such as illustrating, looking at a globe, or creating something) which reinforce the lesson. 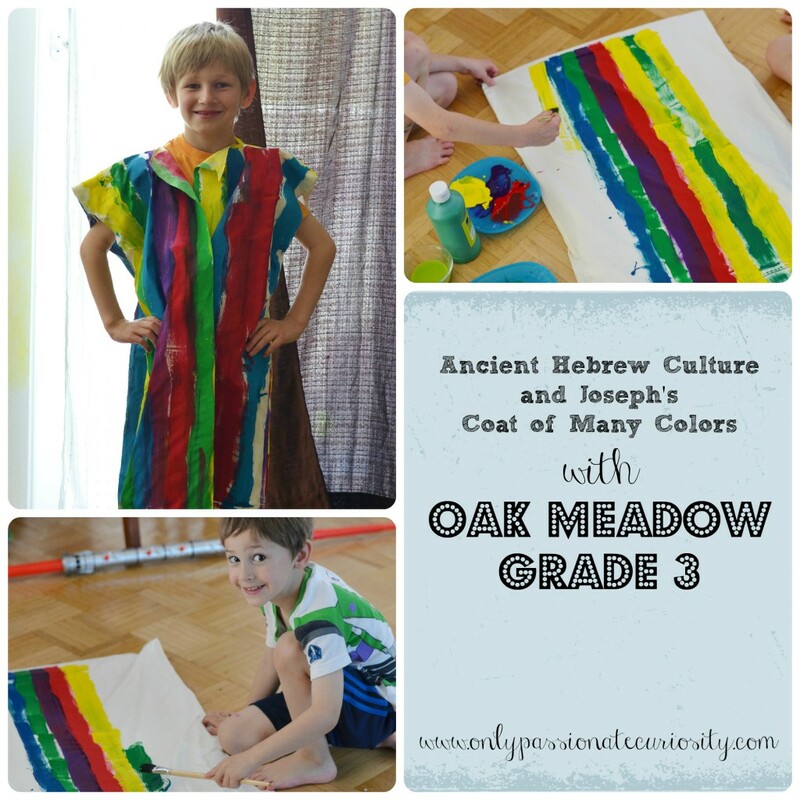 For this lesson, we talked about the Ancient Hebrew Culture, Told the story of Joseph and his Coat of many colors, and made a coat to wear. We discussed dreams, reality and if we think our dreams have meaning- The discussion also lead to a wonderful conversation about favoritism, jealousy, and appropriate actions. Science: The science lessons contain many hands on, observation based, and outdoor activities which help your child explore the world around them. For example, while learning about clouds, your child will go outdoors each day to observe them and identify what they see, while illustrating a “cloud journal.” When learning about salt water biomes, your child can visit the beach, or read a book about the ocean if you don’t live close to a beach or aquarium. Art/Crafts: Art includes working with clay, drawing, marbling paper, woodworking, book binding and water color painting. Most of the materials you need are included in the optional Craft Kit you can purchase from Oak Meadow (I highly recommend it!). Art is done about three times a week during the year. 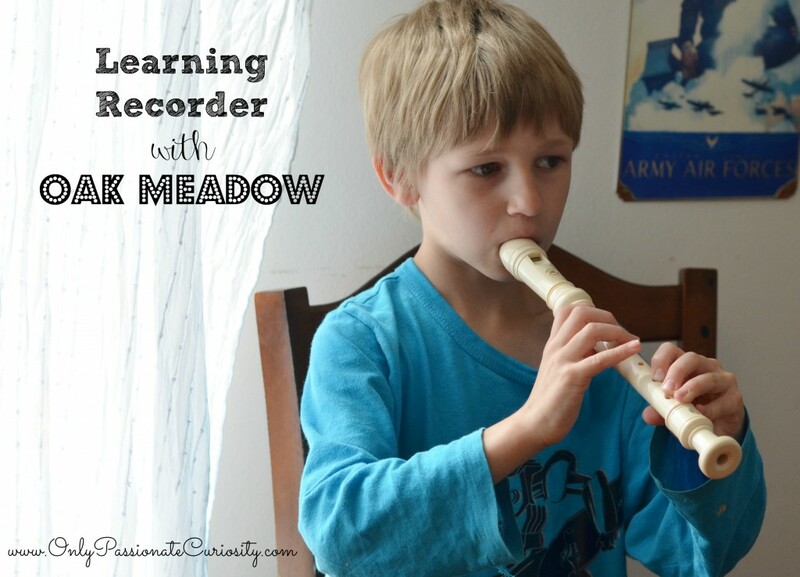 Music: Oak Meadow’s Third Grade Program comes with the Advanced Recorder book. If you have no experience with recorder, you can order the Beginning Recorder book, but the syllabus’ music section does contain some beginning recorder instruction. The craft kit comes with two recorders, so you can learn to play right along with your child and teach them by example. Health: If your state requires Health as a subject, or you’d like a formal curriculum for health, Oak Meadow has a program for Kindergarten-Third Grade called Growing, Growing Strong. 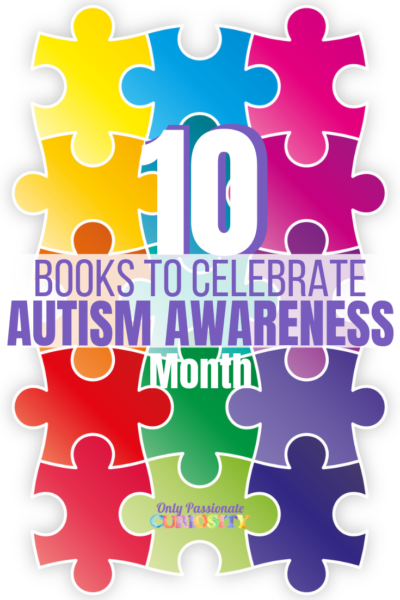 This book is broken down by topic, like “I share Food, not Germs” and shares lessons, activities, recommended books, and other ideas to teach each topic. 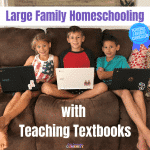 It’s very well organized and user friendly- each week, Oak Meadow recommends teaching one lesson from this book, and I think it could be used in any Homeschool successfully. We’ve had a lot of fun with Oak Meadow. When I first started talking to you about this program, I shared how I wanted to establish a better routine in my home, and really get back to having fun with school. I have struggled a little setting a new routine, but the last week or so, I really feel like I have it together. When I struggled, I found wonderful support in a community of Oak Meadow Homeschoolers on Facebook, who were happy to share their experiences and helped me find a routine for my own kids. We have been able to incorporate circle time as something we all do together as a family, and my 5 year old enjoys listening into the stories with his older brother. The practical advice, such as having time for the kids to work with me for chores, and letting them use tools sized for them has really helped me maintain a cleaner, more peaceful home (a really nice side effect of chore time and practical skills being included in the curriculum!). Bug has increased the amount of dishes he can cook independently, and often cooks for his brother and sister at lunch time using the First Cookbook. I wanted a program that would help me to be a better homeschooler, without feeling like we were chained to a desk. Oak Meadow has allowed us so much flexibility. We are able to complete the week’s lesson in a 4 day school week, keeping Fridays for our field trips. The program for Third Grade is still playful, and full of fun and imagination- but don’t let that statement fool you into thinking its “light.” The more time I spend with this program, reading the syllabus and teaching the lessons, the more impressed I am with it. The lessons, while gentle, are deep. The conversations that come up while discussing the history and folk tales have been entertaining and enriching. I can see Bug learning and growing with this program, but he is doing so with creativity and play. It’s really a beautiful thing. I am really hopeful about this program, and am really curious about the higher levels. Grade 3 is really a transitional year, it’s the last of the “early years” levels. When discussing Oak Meadow’s Waldorf influences, they say “Today Oak Meadow provides a very creative, experiential curriculum that is playful in the early grades, rigorous in the upper grades, and engaging for all students”. I really can’t wait to see “what is next” with Oak Meadow. Oak Meadow has curriculum for K-12, and is Waldorf inspired, especially in the early years. This means that it is creative and playful, and uses traditional folk and fairy tales to teach children about the world around them. The curriculum has wonderful multi-sensory activities and teaches in a way that appeals to children, through movement, rhythm, and beauty. The program itself is not open-and-go, but IS set up in a format that is user friendly. I would highly recommend this program to anyone looking for a program for a creative, active child; especially for families that value flexibility and family routines. Oak Meadow offers families several different options, to either use their Homeschool curriculum independently (pictured here), or through enrollment in their fully accredited distance learning school, which offers teacher support and official school records. Oak Meadow is one of the least expensive complete curriculum companies on the market, with complete curriculum packages (not including the craft kit or K-3 manuals shown in this review) for the Third Grade coming to only $325. It is an incredible value for it’s price and I can not recommend it enough! As a military family, we always appreciate when a company goes above and beyond to show their support- Oak Meadow offers a wonderful 10% military discount to active duty military families. To use this discount on either their print curriculum or with their accredited school, please call the office at 802-251-7250 for more information. (discount not eligible for use with sales). I really want to make sure you guys see how this program works in practice, so check out out post about “A Week in the Life with Oak Meadow.” I want to be able to show you what the work load looks like, how we structured our week, and what our daily rhythm looks like when following Oak Meadow’s Third Grade program. Military discount is also available to veterans with a valid DD214. As a Guardsman who served on active duty, I really respect this. Without taking away from what active-duty families go through, I can say from experience that reservists and Guardsmen also sacrifice time with family and career opportunities for the sake of national defense. In some ways it’s more challenging, since we don’t receive support for housing or subsistence. The discount is greatly appreciated. With my oldest son having ADHD and Dysgraphia I need something that is more verbal and flexible for him so he does not stress out on the handwriting part. Love the way this is set up and his love of science and math would benefit from this program. I also have my daughter that is going to be starting to learning preschool level so it is always fun to add her teaching in with her bothers when I can. #rd grade would be wonderful to win for both of my children. I wonder if using The Heart of Learning and the home teachers process manual could be used minus the rest of the curriculum? I would love to have it all, but that may not be an option for us. Can you say more about the skip counting circles. They look interesting, but I couldn’t figure out who devises the pattern (kid experientially, parent guiding a particular shape, etc.). Thanks! For the first one, I traced a bowl on the page for him, and showed him how to write the numbers in a circle around it like a clock face. The Oak Meadow syllabus shows you how to set it up, but you can probably see well enough from the picture. Then, I gave him a ruler, and told him to connect the numbers around the circle as he skip counted. He discovered the pattern independently, which was kind of fun for him! It emerged as he was counting, and the more he did it, the more the pattern was self correcting, which helped him be more confident about skip counting. It’s a WONDERFUL idea and teaching tool! I have used Oak Meadow for years with my three children. I love it. I especially love how it educates the whole child. Living Education Journal is a good resource too. Our favorite article was the fairy house and garden one. My children love building them. Family, Nature and Creativity! Exactly what we need to focus on at our house! Your blog is great. I love reading it! You make me a little less nervous about homeschooling. You make it look so fun! As for you, you are one amazing lady. I’m so glad I met you! I am seriously considering switching over to OM curriculum for our homeschool! I really like the “educating for the future” idea. We need to be looking at the end result, not only for our own children, but future generations as well. Sustainability reaches all aspects of life. This curriculum sounds fantastic and very well thought out. I’m excited to learn more about it! This looks like something that would be great for us. I had not even heard of this before. Thanks. I’ve been contemplating using Oak Meadows for years and this year, I plan to. I have read The Heart of Learning and it resonates so strongly with our approach to our children and learning and living. I laughed while reading it because it was such a great synopsis of all those lengthy and costly books I’ve been reading! Thanks for the review. I am super curious to follow along and see how it “fits” with families with multiple children. I have 3 and another on the way! We are just getting started with homeschooling, and Oak Meadow is in our future. This giveaway would help out a ton! Thanks for the opportunity. Hi there! I SO want to win this giveaway..I homeschooled my daughter until the 3rd grade and then she entered the school system because of many life changes; Four years later I am looking back in retrospect and really wish I had kept her home! This coming fall I will be homeschooling her again, 8th grade this time around, and I will be homeschooling my two sons as well! As far as the articles I enjoy/utilize from OM’s journals, I would have to say the permaculture info (we are homesteaders) and anything to do with seasonal art activities (we live in the woods and love anything to do with nature and the changing seasons). We’re just getting started, and I was already considering Oak Meadow…so this would be perfect! Thanks! Arts in Education–I am trying to find a way to regularly include all forms of art in our homeschool! I’d love to try Oak Meadow! I have two girls and I am considering this. Thanks for the giveaway! My mother used Oak Meadow 20+ years ago, only part of a year for me mostly for my sister, I remember being jealous of the schoolwork she got to do. This past school year I used it for my girls, Kindergarten and Fourth Grade, I have my box here now for the upcoming school year, 1st and 5th grades, we love it! I love the expression and experimentation it allows and encourages! just found your blog! so blessed! have four young ones at home thanks for the great blog! Oak Meadow on fb told me to stop by here- I’ve just decided to use this program as our first year starter kit, so your blog was wonderfully timed! I’m starting our first year home schooling- and this is the curriculum we’ve chosen! Oak Meadow is my all time desired curriculum! I don’t know how ds would do with it, but I so desperately want to try! “Practical Tips” is also my favorite article. The one article that stood out to me right now, because they were all good is “The Joys of Authentic Engagement: Blending Curriculum- and Community-Based Learning” article. I appreciate your review and am looking forward to more posts. It is so in depth and really helped me decide to go in this direction with my kiddos. I think this is the missing spot with my dd. And of course, a giveaway is always great too! “Thinking Outside the Box(ed) Curriculum’ This is where I am now, I don’t want to miss out on teaching my kids something they need but I also want to do things a little differently. I have been trying to decide between Waldorf inspired curricula for my daughter who is very artistic, but also has some learning disabilities. I like that gentle approach, but realize that I need a full curriculum. I think Oak Meadow is for us. I love the activities the recommend. Especially the flower pot compost. We’re moving to the city and that is a fun experiment for our kids that we’ll be able to do even there! 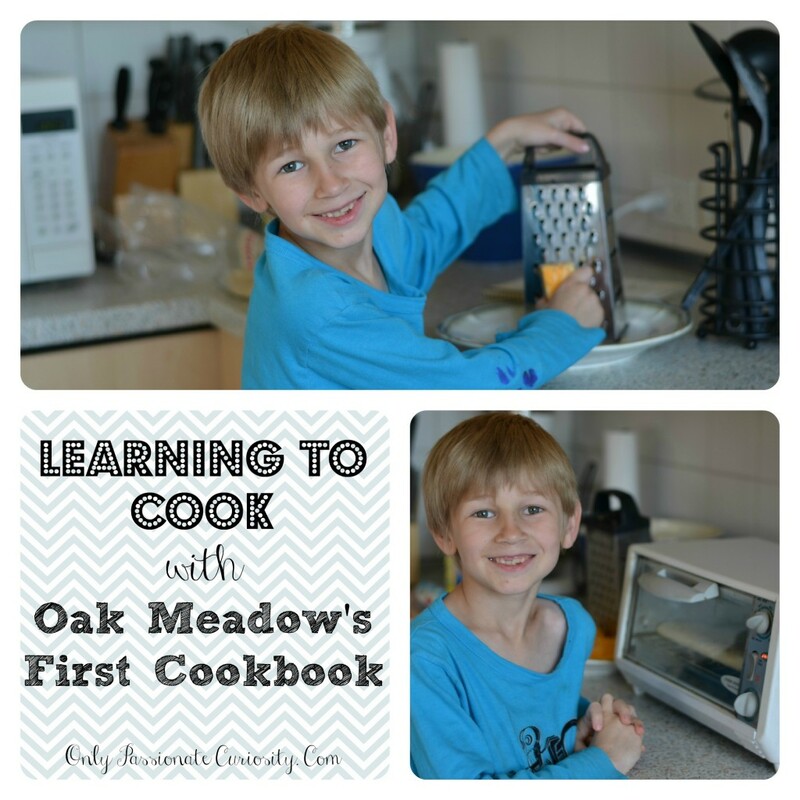 I’ve homeschooled for many years and wish I had known about Oak Meadow before this! But I have 6 year old twins and this curriculum sounds ideal. Thanks for filling us in on some of the details! Wow! This is amazing. We will be homeschooling for the first time in the fall! We would LOVE to be able to use Oak Meadow, unfortunately finances prevent us from using this curriculum. I enjoyed Families Lead The Way. Spending time together as a family is so important to me and it is great to see that Oak Meadow believes in it strongly enough to make it work for their employees! I read the facebook rewind: Home schooling multiples. This being my first year teaching at home, I have been most worried about the gap in the ages of my children. One in 6th grade and the middle one starting kindergarten I had little hope of combining any of their lessons together. I am anxious to see what ends up working for our family. l really liked “Seasonal Activities for All Ages: Earth Cycles.” It turns out we already do several of those activities! We are going to start pre-K in the fall and are very interested in the Oak Meadow approach to learning. We are excited to begin our oak meadow. I love their gentle appropriate curriculum that brings the wole body together to learn concepts. I LOVE the flower pot compost article! What a great idea. I’m filing that one away for summer plans. In our homeschooling journey, I try to fall into the natural rhythms of the world around us. I love incorporating ideas like those presented in the issue on Sustainable Living and Learning, many of the articles and activities resonated with us. I loved the fairy houses! I’d love to give OM a try with my daughter. I am new to homeschooling and will be starting a pre-k curriculum soon. Excited to learn and read more on this blog. I liked the ideas in the Earth Cycles, seasonal activities article for Spring. I would love to try OM, but worry about it being too teacher intensive especially with several kids at several levels. Winning a curriculum would let me give it a try. I enjoyed their “Heart of Learning” article and found it really motivating. I’d love to read the full book 🙂 Thank you for doing the giveaway! I have drooled sooo many times over Oak Meadow’s curriculum descriptions – I hope we’ll get the chance to use their curriculum soon. This looks fabulous!! We are starting 1st grade next year and would love this!! The whole concept of the main lesson book is what appeals to me most about Oak Meadow. I know it’s a waldorf hold-over, but OM seems to have made it more accessible to folks that aren’t acquainted with waldorf. I love al the components to this curriculum! Recorser is our favorite! My daughter is going into 3rd grade. I’d never heard of this program before, but it seems like such a perfect fit for her! I have been wanting to create a fairy garden with my little one!! Dreaming about this…thank you for the excellent review. I have three children who will be in K, 1st and 3rd grade this fall and I have been reading all that I can about Oak Meadow. I linked to the page and read an interesting article about “Creative Expression” which would be very applicable to our home school. I love the fairy houses article. Thanks for the review!! This helps a lot! We are going to start homeschooling next year, and we are also becoming a military family, since my husband is in the process of enlisting int he Air Force. We are looking for a Waldorf curriculum to follow in our first year, and Oak Meadow is it for us! Thank you for your very thorough review, it helped me make a decision! I really enjoyed the article Families Lead the Way. Great review! I have added OM to my list to consider for next year. Would love to win a package! My favorite article is about homeschooling multiple ages. Very helpful in my house of so many! I loved the fairy garden idea from the most recent issue. I can see all of my kids enjoying making one. Great review. I’m very interested in oak meadow. The article about Families Lead The Way was so encouraging! You take into consideration what is important to all of us! It’s a huge difference because in public schools they only consider test scores and funding. But here the children are important, families are important and their education is valued! ooooohhhhhh…this would be amazing to have as a resource! We are unschoolers looking for a little more rhythm and routine! The curriculum spotlight on sustainability is very interesting. I realize I made friends with some trees, on my own, not part of my own public school education. Maybe that helped me become interested in it later? I definitely want my children to learn about sustainability. I like the Thinking Outside the Box(ed) Curriculum article from issue 112 fall 2012. Thank you for such an indepth review! I have often wondered about Oak Meadow, but I didn’t understand how it worked. We love the fairy houses and fairy garden activity. I love oak meadow and can’t wait to try it this fall! We love OM and have found it to make our family life enriching. We love Oak Meadow. I use their preschool and sixth grade packages with my daughters. I enjoyed the article about the joys of authentic engagement. I see that in action daily as we learn using OM. I love the recent articles focusing on sustainable living AND learning. I have long pushed the sustainable living ideas, but to talk about sustainable learning was a great addition to our focus. oh! building fairy houses is a big thing in our family right now! The Spring 2013 issue that talks about Latin. I love learning about Latin, and am thinking of bringing that into our homeschool. Thank you for the amazing giveaway! I’ve been wanting to do a fairy house and garden with my daughter, so that article was perfect. Sept 2009 issue – they made wooden buttons from fallen tree branches 🙂 love!! We want to try the OM curriculum with our boys. I love the Waldorf philosophy, it makes so much sense to me. Practical tips for simple living. I have this open to read right now as this is where are family is at and what we’re trying to accomplish this year! I enjoyed the seasonal activities for all ages. We did the sunflower hut idea with our homeschooling group! I am very grateful for the _Living Education_ journal. This is our first year of homeschooling, and I have already made lots of use of this resource. The Arts in Education edition has been my favorite recently. I love their information and advice on different learning styles. It has really helped me in dealing with my two boys who have very different learning styles! My daughter would love to build a fairy house. 🙂 How fun!!!!!! Great review! We have used Oak Meadow’s main lesson books and block crayons, and would love to take it a step further with our 2 sons (5 & 8) by using the whole curriculum. Thanks for hosting such a wonderful giveaway! The Joy of Authentic Engagement has been my favorite article in this last edition of Living Education. It is a wonderful reminder that my boys will learn best if we are all actively (and interactive) learning. Time to toss out the worksheets and get hands on! The article “The Joys of Authentic Engagement” resonated the most with me. This sounds wonderful! I like the way it is put together. It sounds easy and fun. I enjoyed “Practical Tips for Simple Living”. There are a few things I already do and a few others that I will be implementing soon! I like Oak Meadow’s overall philosophy and can’t wait to include their curriculum in our new homeschool. I like their tips for simple living and sustainable practices. I love the fairy houses ideas! We just started hearing about fairy houses! I really enjoyed the article Nature and Story. It reminded me of my own explorations as a kid and the journey from initial curiosity to actively seeking knowledge. We’re just starting our homeschooling journey and the Oak Meadow looks like it might be a good fit for us. Fingers crossed and hoping I get picked! I’ve been looking into Oak Meadow and am very excited about starting it with my kindergartener! We are just starting our homeschool journey – DS is going to be doing grade 1 at home! I really enjoyed the nature and story article. fairy gardens! babygirl really wants to make one! The Sustainable Living issue is open in my browser now – off to look through it!! Thanks so much! I read an interesting article by an Oak Meadow student ” Sustaining the Flame of the Ancients” by Belle DiMonté. My daughter is showing a lot of interest in classical culters and would enjoy learning latin! I I have been looking at curriculums for a while now. I think Oak Meadow is going to be our 4th grade winner! I really like the Homeschooling Multiples and Practical Tips for Simple Living. Both are very important and relevant for me right now as we add a third child to the mix this fall! Ooh, I love the fairy house article in the current issue! D&D would love to make one! I absolutely love your review! I’ve been wondering what it actually looks like to use the Oak Meadow programs (for years) and you have done a fine job explaining it. After a few years of wondering what we will do for school for our children, I believe the best option is to home-school. I would seriously love to win!! Thank you for the chance! We have always loved the nature activities. I love the grass in the basket and it has always been a hit here at home. As always I love the natural ideas. I did the grass in the basket a few years ago and it’s been a big a hit every time I do it again. We currently have the 6th grade curriculum. Paging through some of the books, I’ve been impressed with the suggestions for practical experiments and hands-on activities. I’d love to win the 7th grade curriculum! I like the article “Joys of Authentic Engagement” from the newsletter. I really enjoyed the article ‘Families Lead the Way’. My husband is mentally disabled and does what he can earning money doing odd jobs. For many years, I worked 60+ hours a week supporting our family. When we started seeing signs of serious issues with our daughter, we decided to cut back and allow me to stay home to take care of her. We live on $1300 a month and sometimes that’s not easy. Family is very important to us and to that end I have opened an online shop with 2 friends to hopefully allow me to continue staying home and taking care of my family. We are starting with Oak Meadow this fall, kindergarten and Grade 2. I’m really hoping I goes as well for us! Thank you for this review. “Simple, Sustainable, Living”….this article hits several goals our family has been working towards this past year. The activity suggestions are great too! I loved the heart of learning. It really speaks to what we are trying to do here at our house. My boys and I are looking forward to making fairy houses for our garden this summer! I love your review! It was exactly what I was looking for! I am so glad it helped Natalie! I really enjoyed the article on homeschooling multiple children. I am new to homeschooling and can use all the advice I can get! This will be our first year with Oak Meadow (and homeschooling!) and your review has gotten me so excited to start! I can’t wait to take this journey with my kiddos! Thanks for your post! Is the cookbook something you buy separately or does it come with the 3rd grade curriculum? I would love to get my hands on it! Ashley, The First Cookbook does come with the Third Grade program if you purchase the package, but you can also buy it separately. It has a lot of kid friendly, easy to make things- including smoothies which Bug thinks is totally awesome. We just started OM7 in our home last month. It has been a great fit and I’m sorry we didn’t try it sooner! The Joys of Authentic Engagement struck a chord with me, as did Sustaining the Flame of the Ancients. What a great newsletter, full of good content. It is a great one isn’t it? I love that it has helpful, interesting articles! Learning and the Natural World! Love it! I would love to win the 8th grade! OM has always looked so good to me, but my eclectic gene has always talked me out of it! I enjoyed the article about fairy gardens. My daughter LOVES fairies and looks for fairy houses every walk we take. Thanks for the opportunity! I loved using Oak Meadow for our 3rd grade year! I’m still one year away from homeschooling, and already with 2 children. The article about homeschooling multiple children was very helpful in calming some of my already nerves about the possibility of homeschooling. Love Oakmeadow’s philosophy and the practical tips for simple living. Thank you for the review! Sounds like a perfect fit for us! Very thorough and helpful review!! Good job!! Great review..we’re doing OMK and OM1 at the moment, looking forward to the years ahead!! This looks great! I really enjoyed the focus on sustainability. That is something very important to my family and I. I am even pursuing sustainable agriculture as a Bachelors! I really like that they also had information on learning styles, as that is something that I became very aware of as a high schooler when I was struggling in public school. I want to make sure we find the best fit for my children! I liked the ideas on sustainable living. It is something I try to instill in my children. I like the article I read about homeschooling multiple children. This is our first year homeschooling, and I think that will be the biggest challenge. I liked the Earth Cycle seasonal activities. I didn’t realize (duh) that OM is on Pinterest…now following and too many good links to pursue. This giveaway is amazing, thank you for the chance! We have been teaching our children about gardening and other sustainable living activities so I really like the article that list suggestions for sustainable learning and living activities. I especially like the suggestions for relationships. Thanks so much for this giveaway! I liked the article about Fairy gardens the most. I have been wanting to try oak meadow for a while now, but havent been able to. Id love to win this. Wow–this is amazing! And what a child’s life/edu should be like. I’d be honored to win. In my stage of life the article about Homeschooling Multiples spoke to me. I always feel like a juggler in a very tough balancing act! Thanks for The great giveaway! Sustainable living was Great!!! I have never Heard of Oak Meadow before, I’m excited!!!! I have always been intrigued by Oak meadow, but have been afraid to take the plunge. I would love to win this for my little guy! Love Oak Meadow! Really liked the article about learning styles from fall 2012. I liked the seasonal activities. They looked like a lot of fun! I liked the make a wand activity! I love the sustainable relationship ideas! I’m just starting hs and would love to win this. thank you for the giveaway! We’ve enjoyed Oak Meadow for 1st and 2nd grade! I like the articles on seasonal/nature topics… The review of Amanda Soule’s new book looks interesting, too! I have seen the Oak Meadow articles in previous giveaways, and every time I see something new. Heart of Learning is still my fave. Thanks for the review! We’re doing OM3 next year. I have been looking at this curriculum for a while now & considering it… I love their nature focus. I love your review & would love a chance to win! I found the Flower Pot Compost article interesting and very do-able. We keep meaning to start composting but haven’t started yet. my little one would love a fairy garden! I love the books that are picked out for literature! Things my son would love! Pick me pick me!!! I’ve been looking for a box curriculum. Very excited to read more about Oak Meadow. I really like the Waldorf method and think that my son would do great with this style of learning! Thanks for the great giveaway. Would love to win!!! Great review and I agree wholeheartedly after finishing OM3. We recently attended a Fairy Festival so the article about the Fairy Garden definitely peaked my interest as I know my daughter is very interested and excited about all things fairy right now. Also I would like to add more music study to my 3rd graders homeschool schedule so I am very interested in the curriculum using the recorder! What a great giveaway! We would love the chance to try this out!! I love their article about nature and story and how some simple interests and questions lead to a much wider exploration and on-going learning. I liked the article about simple sustainable living, 30 tips. What a thorough and useful overview! Thanks! I am planning on focusing more on the arts in education next school year. I have an art degree but found myself focused on academics. It was our first year homeschooling and I think I was a little anxious about covering everything. Funny, because I know the importance of creative problem solving and expression! I liked the Fairy Houses and Fairy Gardens article. My 5 year old is very into fairies, she would love doing that! I loved Teaching Sustainability. I’ve found it to be a really hard thing, much harder than it seems. I would say the Facebook Rewind: Homeschooling Multiples. Its not easy dividing your time. I like the study skills toolkit from the Fall 2012 issue! Why have I never looked at Oak Meadow before? Looks interesting. I most connected with this one: Learning and the Natural World. I don’t feel we have done enough of this and I desire to do that much more than I am. Living in the city makes it tricky, but not impossible. Thanks so much for hosting this. Fabulous giveaway! Thanks for the link to those articles…the activities section is one I’ll read first, especially the Earth Cycles. Thinking outside the boxed curriculum. This sounds awesome, I’d love to give it a try! I loved Liz Gardner’s piece called “The Joy of Authentic Engagement” in the Spring 2013 edition. I appreciate how she sheds light on the role homeschooling plays in living a more sustainable life as a family. I liked the Winter 2012 edition on writing. I love writing and studied communication in college, but it is something I struggle to teach to my homeschooled daughter. This is our first year. Would love this for my son. I like the Fairy Garden article. My daughter enjoys exploring the many fairy gardens in my grandmother’s Mt. Gretna, PA, community, and this would be right up her alley. I liked the Heart of Learning article- by they way thanks for always helping us find these gems!! Oak Meadows looks like a great option!! Thanks so much for the opportunity!! I always enjoy the OM newsletters, but I really loved the Spring 2013 article “Families Lead the Way”. It made me admire OM more than I already do, and wish that we lived near them so we could become part of their “family”! Curriculum- and Community-Based Learning” article. Have been wanting to switch to OM for two years, just more than we can afford for all 4 kids… I really love their philosophy and approach to educating children, and appreciating the aspects of learning and life that are so often left out of the equation. The Facebook group I linked above has discussed this a few times and would be happy to discuss the idea with you. You could also call OM- they are wonderful about helping choose appropriate levels- they probably have advice for combining kids as well. Your review is the most complete OM review I ever saw – thank you!!! As for articles/issues, it is hard to choose only one. But if I really have to choose, I guess I would pick up the issues (hehe, it’s not one again!) with citizenship and the latest one, about sustainability. The “The Joys of Authentic Engagement” resonates with me. I can’t wait to read through some of the past articles in the living education journal! This website alone is a fab resource. I love Oak Meadow. Your review is lovely. I like the sustainability article. Great stuff! I shared this on facebook and am trying to pin it to pinterest – experiencing a little difficulty though – not sure why the page keeps freezing and won’t let me pin. I will keep working on it! I enjoyed the “families lead the way” article. We love Oak Meadow it is a great fit for us. Just wait til you get to the high school level- they are fantastic! LOVE the article about sustainability! Make do or do without is a great motto to live by! Great review. Can’t wait for the day in the life with oak meadow post. I would love to try this curriculum. I think it will prepare a well rounded scholar. I enjoyed the article Families Lead the Way. I subscribed to their mailing list and look forward to reading more. We just received our OMk and we can’t wait to get started in sept!! It’s deep, but not overwhelmingly involved 🙂 LOL- I tried really hard to cover everything in this review, but in practice everything meshes and flows so well, you almost don’t even see how deeply it’s teaching until you’ve done it! This curriculum sounds wonderful. I’m even more excited about it now. I like so many aspects about it. The routine in particular. We’ve been adding a circle time into our mornings (candle included) and the kids love it! Thank you for sharing. LOL did you read my post where the baby burned herself on the candle? We’ve sense then brought it back- but it stays on the shelf instead of on the floor with us! The Active Learning from way back in 2011 resonates with us! We are all about different learning styles here; no reason to make things difficult by teaching the kid in a way they don’t learn well! I’ve been curious about this curriculum for a long time, it really sounds complete and fun! I love Oak Meadow! We have bits and pieces (I love that they sell the items individually as well as in complete packages). It would be neat to get my hands on the whole shebang. The practicality aspect definitely appeals to me. I’d love for our kids to know why their learning is so valuable throughout life. The recorder curriculum caught my eye! I have been looking for one! Thanks for the contest! Great post! I’ve not looked into Oak Meadow much, but this makes me wonder about using it. Very much looking forward to your post next week about how you’re implementing it in your home! This sounds like a perfect fit for my home! I love that they work to make homeschooling fit into your every day routines. Cooking for siblings! Perfect! Thanks for sharing. I also loved the article on Practical Tips for Simple Living- something I am struggling to succeed at. The Joy of Authentic Engagement really hit home with me too. I really liked the article Simple Sustainable Living. 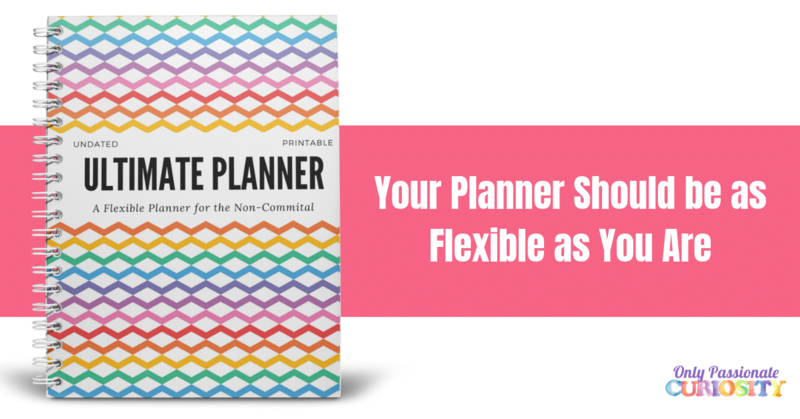 It has great tips for cutting costs. I wrote down the quote on the top of the page to hang it up in my home. Teaching Sustainability. It’s something my husband and I have been talking a lot about actually and something we definitely want to teach our children! I really liked “Heart of Learning” which referenced the importance of getting children back to nature. I am looking forward to my home school journey with my youngest. 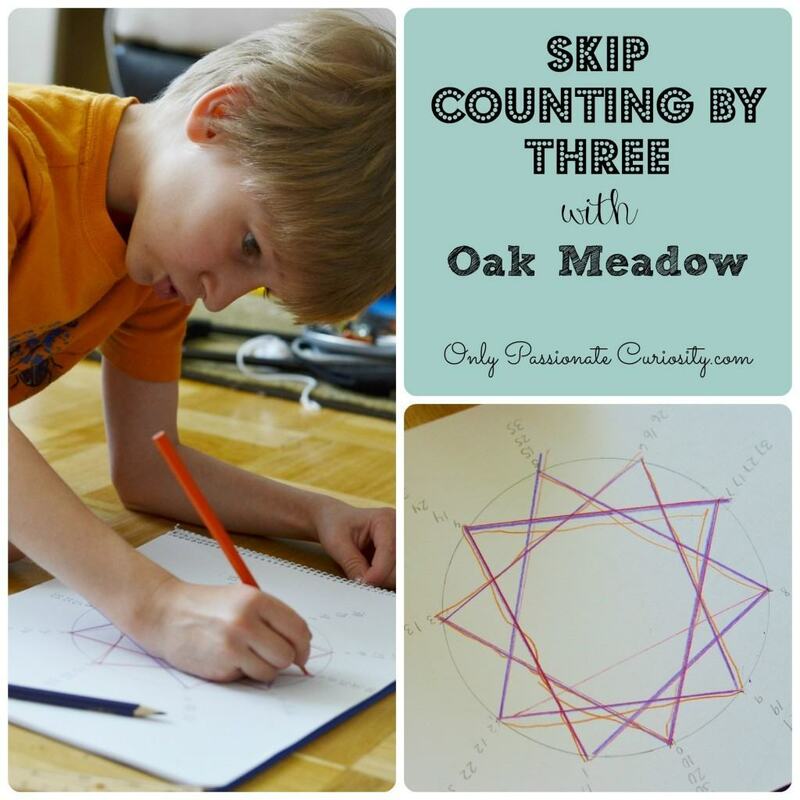 I would love to win an oak meadow curriculum. You mentioned this curriculum is Waldorf inspired, what does that lean towards? Classical, Mason, Unit Study, etc? “Practical Tips for Simple Living”, is the article that I enjoy most. It contains a lot of great ideas that are easy to do.